Nobody has ever been able to catch The Great Googly Moogly – a giant and terrifying fish of legend. But Stella aims to do just that. Armed with fishing gear and differing baits, she sets out every day to realise her dream, whatever the weather. But what will she do if she succeeds? 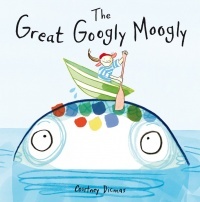 Courtney Dicmas’s latest book features a strong and spirited character determined to achieve her goal, but it also reflects our responsibilities to other creatures, and our place in the natural world.